The first time we played Chibi-Robo! 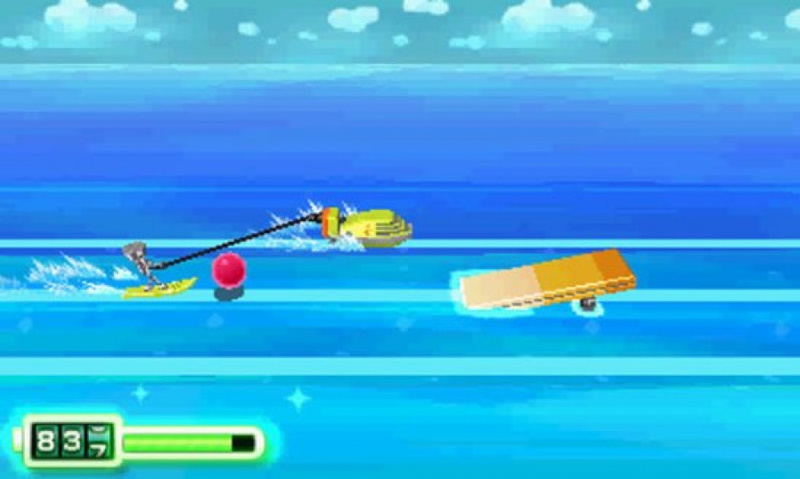 : Zip Lash at this year's E3, it was on a 3DS tethered by cable to a mobile Nintendo representative. It felt oddly appropriate given the wired nature of the game's protagonist, but sadly, pressing 'B' did not - as we would have hoped - release the cord. Later on during the show, we got to sit down with the game for an extended play session, and ended up going through each of the demo's 5 stages several times over - not because we weren't sure of the verdict, but because we were totally taken in by Chibi-Robo's charms. Chibi-Robo has cleaned house on the GameCube and DS, and most recently taken up photography in Photo Finder for the 3DS, but Zip Lash is the first time the winsome robot's starred in a 2D platformer, where he's tasked with saving Earth's resources from invading aliens. He runs, jumps, and rolls, as you might expect, but he also uses his trusty, ever-present power cord as both a weapon and mobility device. The Whip Lash, assigned to 'X', can be fired straight ahead or at a 45° angle upwards in either direction, and is used to take out enemies, grab and throw objects, open boxes, throw switches, and hook onto specific points to hoist Chibi-Robo up like a grappling hook. 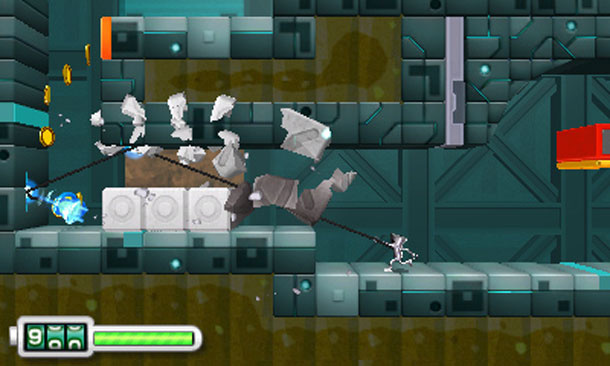 In the first introductory stage we played, these powers were put to use in basic platforming and puzzles, whipping switches and hopping onto higher platforms. It was fun, if a bit rote, and it left us with some reservations. Why couldn't we toss our electric lasso in any direction? Would all the puzzles be one-switch wonders? Why couldn't we use this cord to swing around the stage, Yumi's Odd Odyssey-style? Luckily, our questions were answered very quickly in the best way possible: an upgrade in the next stage that gave us access to a second power cord power, the Zip Lash. 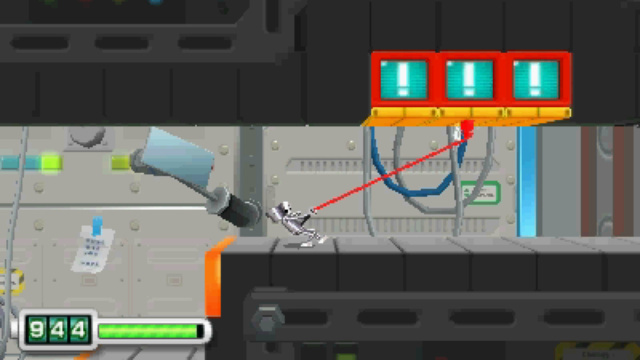 The Zip Lash, activated with 'Y', works similarly to the Whip Lash, but with a few key differences: rather than acting as an instant attack, it has to be charged with a held button press, but it can also be aimed anywhere in the full 360° around Chibi-Robo (with the D-Pad offering precise adjustments), will rebound off of any walls it touches, and can break large blocks. Once we had access to these new abilities, the level design ramped up exponentially. The next two levels we played offered up wonderfully clever challenges, plenty of secret areas, and tons of tangled paths for our Zip Lash to traverse before threading us through to out of the way destinations. Using the Whip Lash and Zip Lash in concert - the former for quick movements, mid-air manoeuvres and enemy obliteration, and the latter for screen-spanning swings and satisfying series of ricochets - felt fantastic. Tight controls and some subtle but helpful aim-assist made for an immediately intuitive experience, and the more methodical nature of the gameplay - everything moves at a nice clip, but it's less twitchy than Yumi's Odd Odyssey or Bionic Commando - meant that we had plenty of time to line up our shots when it counted. Both the Whip Lash and Zip Lash can be extended with power-ups found throughout the levels, and lengthening our lashes was key to uncovering many of the substantial number of secrets in each level. Oftentimes, we'd find an upgrade or power boost for one of our abilities which would let us reach a new area ahead, but, if we backtracked a bit, could also open up secret areas that were inaccessible before. These included dedicated puzzle rooms, where we were tasked with collecting all the coins within a short time limit - usually by bouncing a Zip Lash shot off of several walls in sequence - as well as simple areas containing some of each level's numerous collectables. Observant players will be able to find a number of gold coins, Chibi-Chibi-Robos, and snack items in each stage, and looking for these collectables added a much deeper layer of challenge to what we played of the game - as in the Yoshi titles, getting to the end of a level is one thing, but getting there with all the goods is quite another. The collectables are fun to seek out, too - the Chibi-Chibi-Robos are smaller, faster versions of the hero that need to be bumped into without using your Whip or Zip Lash to secure, and the snacks represent what is perhaps the most endearing instance of product placement we've ever seen in a game. The first snack we picked up was a roll of Mentos, followed by a pack of Pocky and a cone of Mortiz Eiskonfekt - NA, JP, and EU regions all represented by confectionary delights. There's also plenty of trash to pick up, and though our Nintendo rep couldn't say exactly why, they promised that rubbish collection would play an important role in the final game. Our favourite 'collectable', however, wasn't even a trinket in the usual sense, and comes courtesy of the game's extraterrestrial antagonists. In each of the levels we played, one or more lost alien children were wandering around in out of the way locales, and if Chibi-Robo stumbled across them, he could bring them to a special altar (also usually off the beaten path) to call for the mothership. It's a neat mechanic in the first place, as you need to not only find both the alien and the altar, but transport one safely to the other, but the best part was how it's carried out. Standing on the altar and pressing 'X' will swing the little alien around (gently, presumably) in circles above Chibi-Robo's head, creating a whistling sound that draws the mothership down for the rescue. It's sweet and bizarre in equal measure, and it made us smile every time. In addition to the three traditional platforming stages, we got to try out a few bonus levels as well: a water-skiing stage and a boss battle. 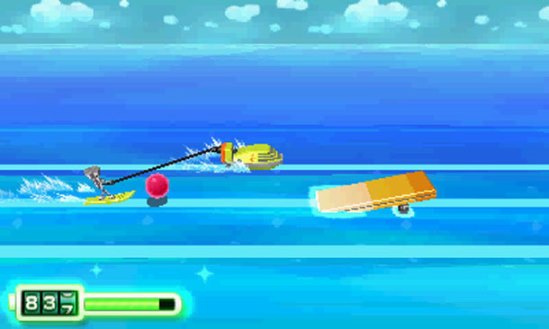 The water-ski event saw Chibi-Robo plug into an RC boat and take to the sea in an auto-scrolling stage with three lanes. It was simple but lots of fun, and tapping 'A' at the very tops of jumps would send Chibi-Robo soaring into rewarding arcs of coins and power-ups. We also had to be careful not to tangle his cord around ramps - the one time we caught ourselves on the opposite side of a jump from a boat, his cord popped out and Chibi-Robo went flying into the drink. The boss battle, against a mechanical kangaroo, was quick and satisfying, and reminded us comfortably of 16-bit conquests of old: we had to use our Whip Lash to take out his feet as he jumped down on us from above, and then come out swinging with the cord at 45° to hit the top half for the finisher. This was - as far as we could tell - only the first world's boss, and we're hoping that later battles will incorporate Zip Lash mechanics and puzzle elements into the fight as well. 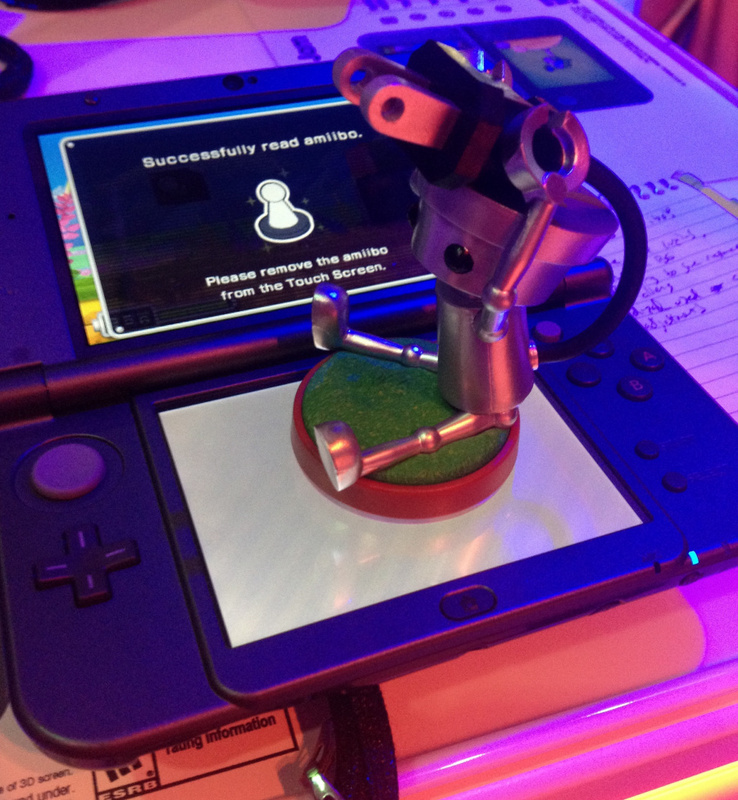 At the end of our demo session, we also had a chance to take Chibi-Robo's adorable life-sized amiibo for a spin. By plopping him down on the New 3DS demo unit's touchscreen, our on-screen robot transformed into 'Super Chibi-Robo', a golden model with a hugely increased health bar and time limit, longer Whip and Zip Lashes, and much faster movement. It was a blast to rush through the levels all powered-up, and felt a bit like playing as Super Sonic in the Genesis games - not exactly balanced, but undeniably fun. Most importantly, the quirky Chibi-Robo charm the series is known for shone through in every aspect of the demo we played. The dialogue - offered up by Chibi-Robo's electronic assistant as well as the eccentric inhabitants of each stage - was endearing and fun, the gibberish voices added an electric-tinged take on the Animal Crossing-style delivery, and the graphical presentation was beautiful. The environments are drawn to Chibi-Robo scale, with sun hats and watering cans towering over our little hero, and we noticed a number of delightful smaller details, like notes taped to the hardware in the background of the mechanical stage. Environmental objects are rendered in a stylized, faux-low-poly retro-futuristic fashion reminiscent of Sonic 3D Blast - bright, bold, and incredibly appealing. In fact, 'incredibly appealing' sums up the whole of our experience with Chibi-Robo Zip Lash. Though it originally looked like a fairly simple platformer, it turned out to be one of our favourite surprises of the show. Chibi-Robo may have started out sweeping, but he takes to his world-beating hero role with style - what we played of Zip Lash was fresh, fun, and genuinely charming, and we can't wait to go back for more. my most anticipated 3ds game after FE. Can't not wait. Sounds like an incredible platformer. I can't wait to play it! nearly forgot about this game! looks great! Definitely my favorite E3 game, even though it was actually revealed in a Nintendo Direct. When they announced a 2D Chibi-Robo, I got sad, but then I saw the trailer. All the great charm of Chibi-Robo is there. Sure I still crave another 3D Chibi-Robo, but at least this game looks great! Awww, happy to hear this. I haven't played a Chibi-robo game before but I thought the main character is great. So maybe I'll check this out once it's out. @ToniK I really would implore you to start with the Gamecube original for the true Chibi-Robo experience. I love Chibi-Robo and Skip Ltd., and I'm definitely looking forward to this game, but I'm a little disappointed about the Amiibo functionality. It's more of the same dull Amiibo usage where something that would have been a hidden secret in a game five years ago is now locked behind a special tax and a physical object which adds nothing to the play experience. Sure, it's optional and unnecessary, but there used to be optional, unnecessary features in games that you didn't need to pay a premium to experience. I'm probably going to play the hell out of this game, it's just a shame it had to be the next victim of pointless Amiibo integration. Chibi-Robo making a comeback has deffenetly been on of the most pleasant suprises this gen.
Coolish. I thought this was going to be drab and basic. Amazing, I'm so happy this game exists. Honeslty, that means 3DS is doing great. Federation Force, TriForce Heroes, and now this game, and of course Fire Emblem are all looking to be excellent or at least solid games. Sure wish I liked playing on that thing more. :/ Every last one of these games would be better on Wii U. Sigh. Nintendo's unified software development can't come soon enough. This further proves that E3 isn't Nintendo's only way to show games because this was shown before it even started. There are other game show asides E3 that is on going as well. As someone who is a huge fan of Photo Finder I can't help but be excited about this game. That title made me a fan of Chibi-Robo and I can't wait to go on another adventure with him! If I buy a single amiibo, or had to pick just one, this one would be it. I'm so freakin excited for this game and have been ever since I watched the trailer. Glad Nintendo Life is giving it some more exposure! Glad it's hitting everyone else's radar in a positive way as well. Bring it! I wanna plug in! I can't wait for this game, even though I wish that they'd also re-release the gamecube version. Can't wait to buy this though! When does it come out to the US? Do all copies of the game come with the amiibo bundled? That was the impression I got from the Direct. Hopefully it keeps scalpers at bay. I am pretty sure it does. So I don't know why people are complaining about the amiibo being just content locked behind a figure. Plus here the game is $54.99, not $44.99 like most 3DS games here in Canada. That's why I know the amiibo comes bundled with the amiibo. With the game I mean. Sorry for the double post but I see no editing button anymore. Very interesting. This game is now officially on my radar. And there are older entries, you say? I guess I'm off to dig through the Gamecube archives. @Pokefanmum82: Just because the Amiibo comes with the game doesn't mean you're not paying for it, as you pretty much explained yourself. It's a premium paid for a gameplay feature which I'd say isn't worth actual cash money, and a pretty cool looking Amiibo which I would unreservedly agree is worth money. I don't object to the object itself, per se, just the unremarkable purpose it serves in the game it comes packaged with. @Rockman55: The rest of the Chibi-Robo series is very close to nothing like Zip-Lash. I don't say that as a judgment of either this game or the ones that came before, but interest in this game is no guarantee you'll like the others. Skip Ltd. is a great developer, though, so most of their games are fun regardless of genre. Just don't go in expecting even a tenth of the action gameplay showcased in this entry. Looked pretty nice when I saw it. Yeah, this could be fun. Hopefully it won't go "straight to download" in Europe. I want a boxed version.